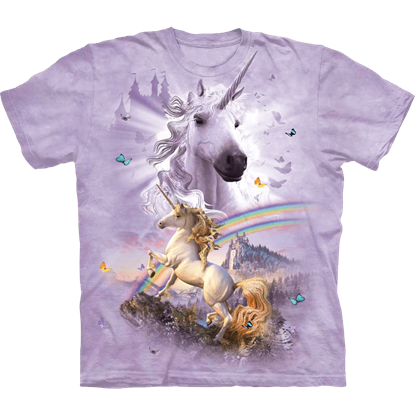 The Anne Stokes Unicorn Heart T-Shirt features a magical scene originally designed for greeting cards. Crossing their horns, a pair of unicorns forms a heart in this beautiful image created by the highly acclaimed fantasy artist. 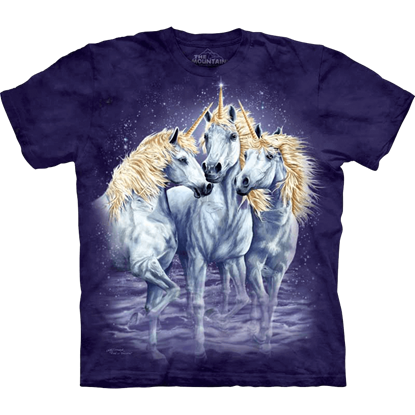 Awe inspiring describes this Awesome Unicorn T-Shirt, because if you happened upon a unicorn in life, awe is a feeling you might have. The view of a unicorn can be forever immortalized in your wardrobe. Deep within the enchanted forest, a lovely maiden finds companionship with a gentle white unicorn. 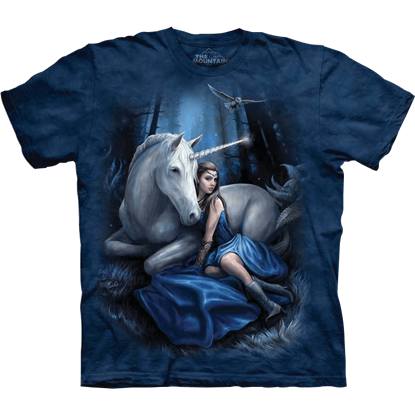 The Blue Moon Unicorn T-Shirt shows this twilight fantasy scene in mystical detail on a hand-dyed, dark blue short sleeve shirt. Almost everything you need to know about the Childs Awesome Unicorn T-Shirt is in its name. 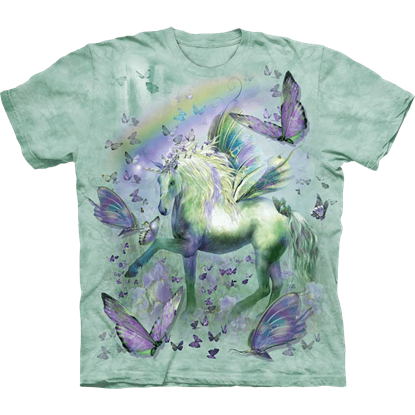 It is a stylish and brightly colored t-shirt that features a unicorn sure to appeal to your fantasy loving child. What child does not love a good fairy tale? 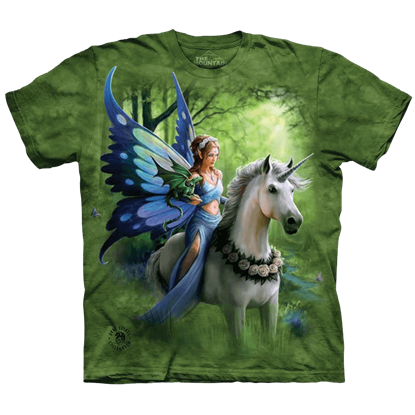 If they love a good fairy tale, then they are bound to love this Unicorn and Butterflies T-Shirt, as it looks as though it has come straight out of one thanks to its color and its design. 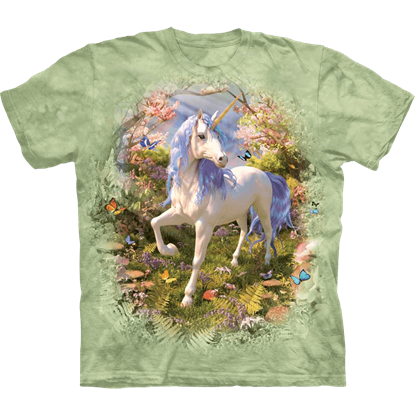 Stunning color and style are what you get when you pick up this Childs Unicorn Forest T-Shirt. This brilliant shirt suits their love of fantasy, serving as a great option that they can wear when they go out and play. 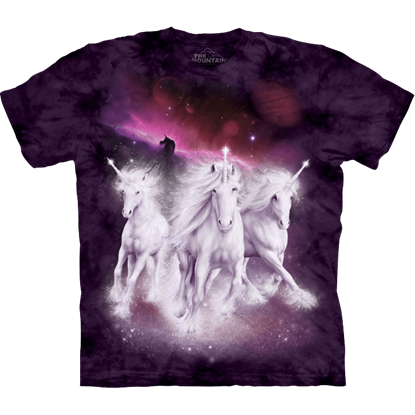 Unicorns are symbols of majesty and grace, and this Cosmic Unicorns T-Shirt does that legendary reputation justice. 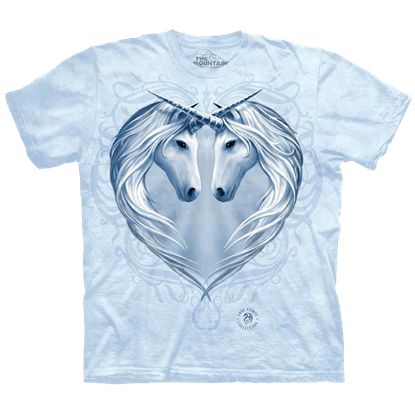 These mystical unicorns are designed with such incredible detail that they appear to prance right off of the shirt! This Divine Unicorn T-Shirt offers an up-close and personal glimpse of a creature that is nearly impossible to capture. 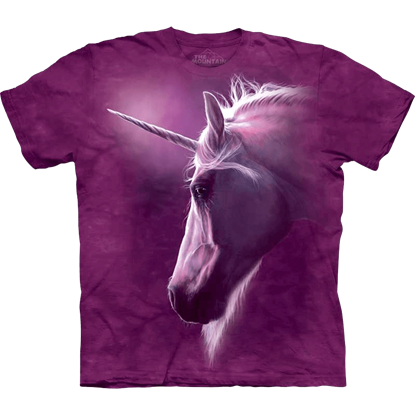 Even in myth, few can even get close to glimpse the unicorn, even as this shirt offers a near perfect view. 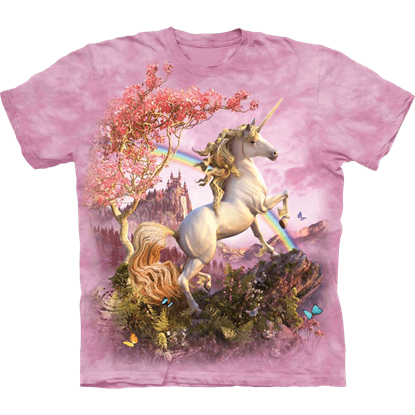 The unicorn is a creature of peace, tranquility, and purity, as well as a symbol of fantasy at its finest, which makes this Double Rainbow Unicorn T-Shirt a great choice for the fantasy fan who wants to show off this equine legend. There is more to this shirt than meets the eye. This Find 10 Unicorns T-Shirt features a trio of fantasy creatures and has a great fantasy design, but it is also a puzzle and challenge in itself, thanks to its hidden images.